We seem to visit Pittsburgh, Pennsylvania, so often that I think I am becoming almost as familiar with the area surrounding the Pittsburgh Airport as I am with Columbus! We frequently stay in Coraopolis or Moon Township during at least one of our overnights in the Pittsburgh area. A recent visit found us in Moon/Coraopolis at dinner time--and we were all in the mood for chicken wings. 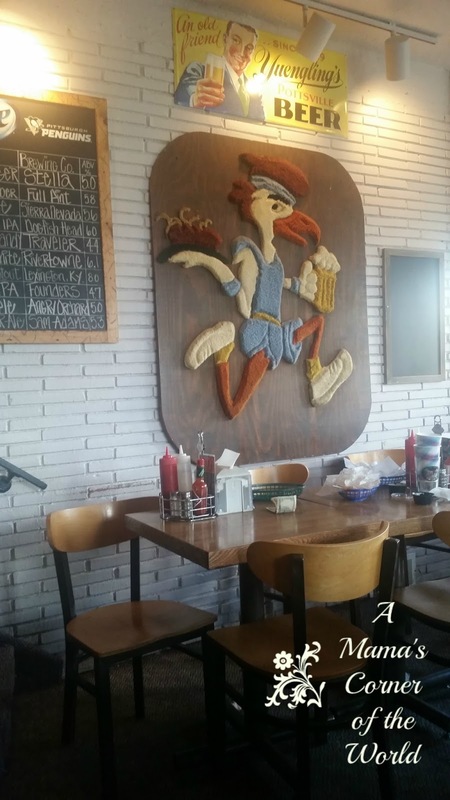 We had driven by Wings, Suds and Spuds roughly a hundred times over the past few years--and, finally decided to stop in. 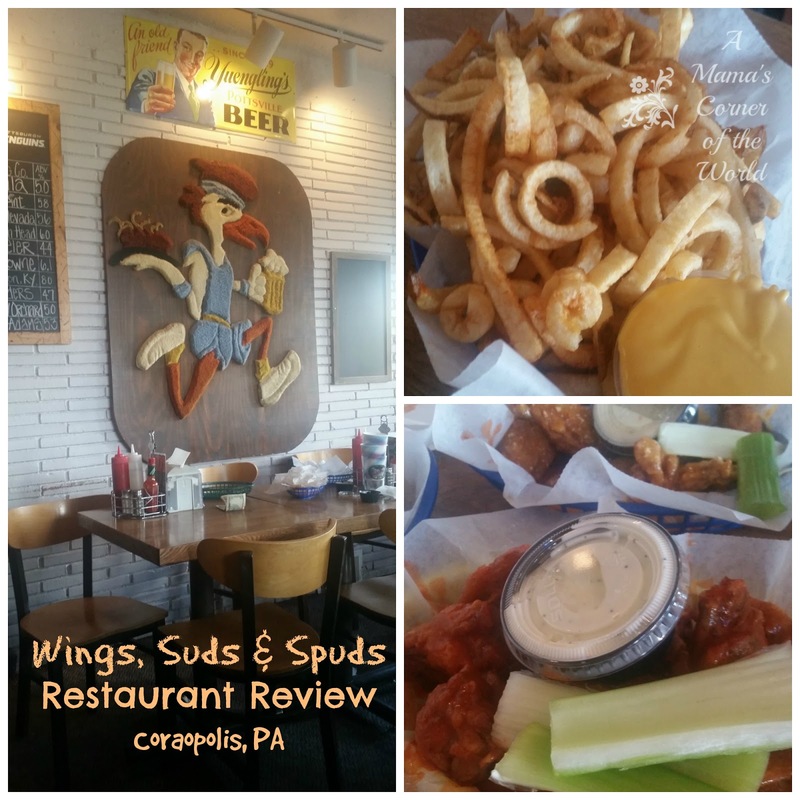 What was our family's review of Wings, Suds and Spuds on the edge of Pittsburgh? Is Wings, Suds and Spuds family friendly? Okay. This was our first concern--as it always is when we venture out to an unknown restaurant with family in tow. The parking lot at Wings, Suds and Spuds is a little larger than we first thought as we view it from the road. The outside of the restaurant is nothing fancy. The husband opted to venture inside for a look around before taking the family in. We knew that beer was a menu focus--we just didn't want to walk unwittingly into a local bar with a couple of kids! While he was heading inside, I noticed a family with tweens/teen girls leaving. He returned and gave it it the "family-approved" go ahead. Small and Simple. 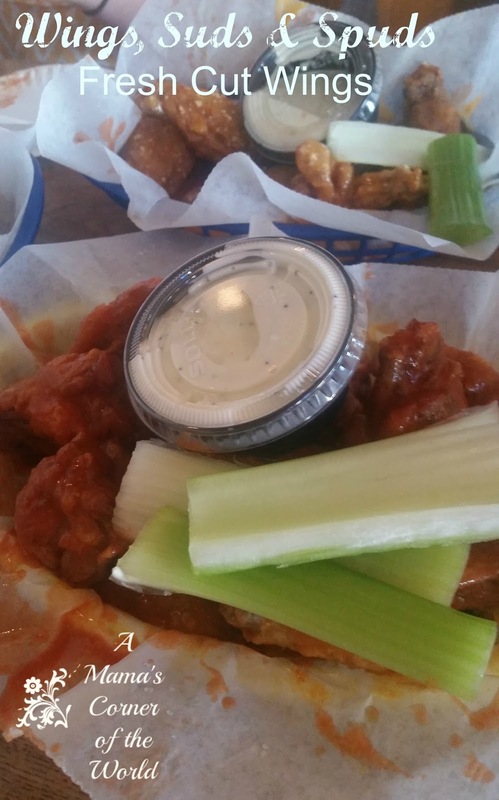 Wings, Suds and Spuds is a small, local, casual spot. The dining area is small and simply furnished. The music was set to classic rock n roll. The menus are pretty straightforward. A one page, laminated menu for food and fountain drinks. 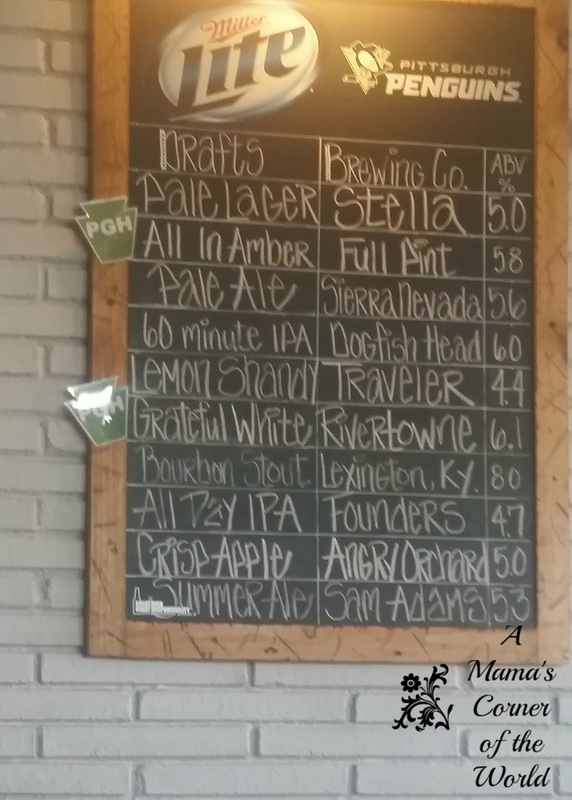 A chalkboard sign on the wall for the draft beer options. There were a few servers working the tables--all of which were filled as the evening moved more toward dinner time. Orders were taken quickly and efficiently. Drinks were kept filled. The front kept busy with a steady stream of take-out orders. Our "family friendly" worries were gone immediately as most of the groups dining (or pick up carryout orders) were families. How was the food at Wings, Suds and Spuds? Yes. That is a container of cheese sauce. The cheese sauce was a little spicy (like a nacho cheese sauce). 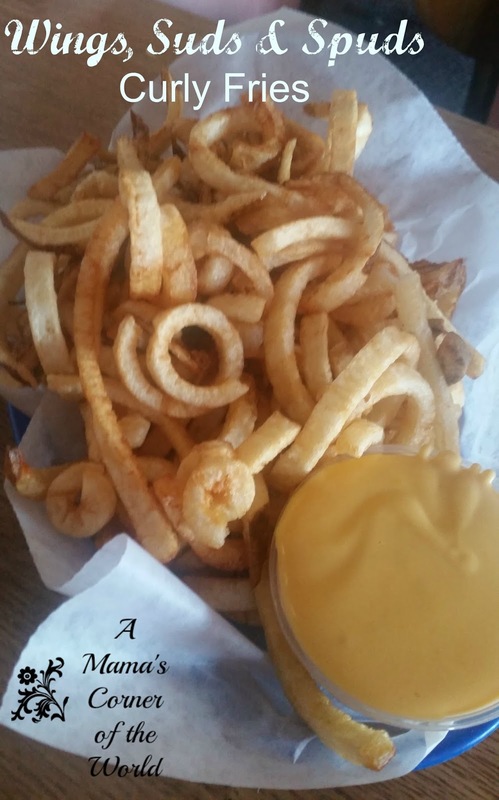 The fries were fried and virtually unseasoned--and, while they probably weren't the healthiest food choice of the weekend--they were really good with the cheese sauce. 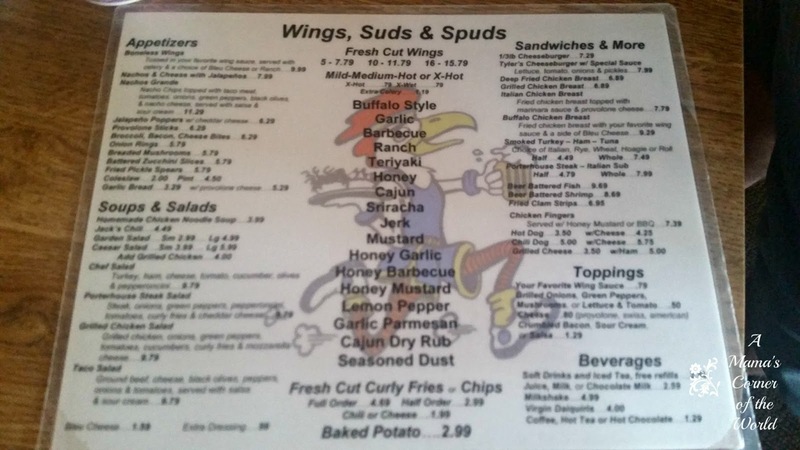 Would I recommend Wings, Suds and Spuds? If you are looking for a fine dining experience--with loads of healthy food options on the menu--this place won't work for you. However, if you are looking for a laid back, casual spot for good chicken wings, beer and fried foods--I would recommend Wings, Suds and Spuds. If we are in the area again; we'll probably simply order wings and fries for carryout--we frequently stay at a nearby hotel. The atmosphere is a little dated--and table service includes paper plates--but, it was family friendly, the service was fine and the food was a hit. Planning a trip to Pittsburgh? Check out Pittsburgh area hotels! That place looks really good.